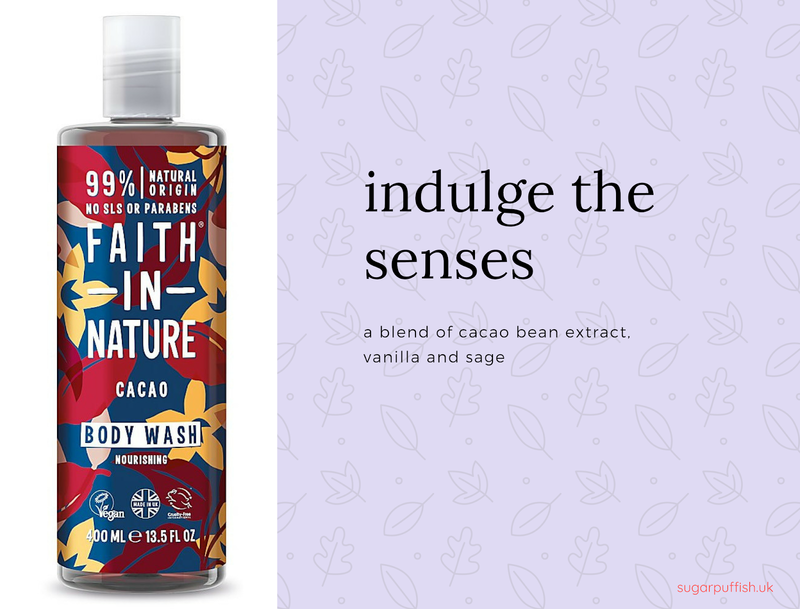 UPDATE JANUARY 2019: Since this review was published Faith in Nature re-designed their branding and changed the name to Cacao Body Wash. It's still a great product. Following on from my post about Nakd bars the connection to this review is chocolate. I wanted to tell you all about Faith in Nature Chocolate Shower Gel. This is a wonderful product and makes a great gift for a friend who is always on a diet. It is free of parabens and SLS and contains no artificial preservatives or colours. I class Faith in Nature as an affordable brand and easily accessible, you'll often find them stock in local wellness stores. The company was founded in 1974 so they certainly know what they are doing when it comes to Green Beauty. This body wash creates a good lather (it does contain Ammonium laureth sulfate) and a little goes a long way when using a konjac bath sponge. The fragrance is a gentle natural cocoa, it is not sweet and sickly so you will not come out the shower smelling like Dairy Milk. Faith in Nature are a cruelty free and Vegan brand with a an extensive range of products for hair, body and skincare. If Cocao doesn't sound like the fragrance for you then how about Watermelon, Coconut, Pomegranate & Rooibos, Grapefruit & Orange to name a few. For those with sensitive skin there is a fragrance free option. I haven't, I'm interested in the products though, they sound just lovely! Oh my gosh! Chocolate shower gel sounds too yummy! I'm afraid if I was on a diet and used this, it would make me want chocolate more!